CarGurus has 53,707 nationwide Highlander listings starting at $2,000. Always a player in the midsize crossover market, Toyota’s 2016 Highlander returns with only a single noteworthy upgrade. The once optional Towing package, with a heavy-duty radiator, 200-watt fan coupling, transmission fluid cooler, and beefed-up alternator, is now standard on all V6 Highlander trims. Otherwise, this family-oriented mini-ute keeps its 3 rows of seating (for up to 8 passengers), a pair of engine choices, all-wheel drive (AWD), and a hefty share of standard appearance features and creature comforts. The 2016 Highlander lineup remains unchanged from 2015, with the base LE, the LE Plus, the midlevel XLE, the Limited, and the flagship Limited Platinum. The Highlander Hybrid, available only in the Limited trim, returns for 2016 as well, but is covered in a separate overview. The non-hybrid Highlander comes with standard front-wheel drive (FWD) and optional AWD. It sports a hefty 83.7 cubic feet of cargo space with the rear seatbacks folded, and can tow up to 5,000 pounds of trailer when equipped with the V6 powerplant and the newly standard towing package. Powering the 2016 Highlander LE is a standard 2.7-liter inline 4-cylinder (I4) engine mated with the traditional 6-speed shiftable automatic transmission to put out 185 hp and 184 lb-ft of torque. Expect mileage to remain 20 mpg city/25 highway/22 combined in the FWD base LE. Optional in the FWD LE and standard for all other 2016 Highlander trims is a peppy 3.5-liter V6 paired with the 6-speed shiftable automatic for 270 hp and 248 lb-ft of torque. Mileage for FWD Highlanders toting the V6 remains 19/25/21, with AWD-equipped trims coming in at 18/24/20. Trim-dependent appearance features include 18- or 19-inch alloy wheels, a rear spoiler, a power-opening rear liftgate, LED running lights, a power sunroof, and the newly standard tow package. The top-shelf Limited Platinum also offers a standard panoramic sunroof. Inside, the 2016 Highlander boasts such standard perks as cloth, premium cloth, or leather upholstery, heated and ventilated power-adjustable front seats, full power accessories, cruise control, telescoping tilt-wheel steering, and a rear-view camera. Higher trims feature 3-zone automatic climate control, an auto-dimming rear-view mirror, LED ambient cabin lighting, memory for driver settings, rear parking sensors, and second-row captain’s chairs (when configurated for 7-passengers). The Highlander Limited Platinum trim adds a standard heated steering wheel and heated second-row seats. Technology in the Highlander starts with a standard driver information display, a 6.1-inch central infotainment touchscreen, Bluetooth hands-free calling, and a single CD/MP3 player with 6 speakers and an auxiliary audio input. Higher trims add such extras as satellite radio, HD radio, and driver voice amplification technology (Toyota’s Driver Easy Speak), allowing the driver to easily speak to third-row passengers. An upgraded 8-inch touchscreen with navigation functions and Toyota’s Entune App Suite (which features smartphone-interfaced apps) is also standard in higher trims. The Limited and Limited Platinum trims keep their standard 12-speaker JBL premium stereo system for 2016. Lower Highlander trims offer certain higher-trim features as options, while the available rear-seat entertainment system, featuring a Blu-ray DVD player and 9-inch screen, returns available to the XLE, Limited, and Limited Platinum trims. Safety-wise, look for the 2016 Highlander stable to boast standard 4-wheel antilock brakes (ABS), traction and stability control, front side-mounted airbags, a driver’s knee airbag, daytime running lights, turn-signal-integrated mirrors, and a post-collision safety system. The Limited and Limited Platinum trims also include standard blind-spot monitoring with rear cross-traffic alerts, while the Limited remains the sole trim eligible for the Driver Technology package, featuring adaptive cruise control, automatic high/low-beam headlights, lane-departure warnings, frontal collision mitigation braking, and Toyota’s Safety Connect emergency telematics. There’s also an optional remote antitheft alarm system for the entire 2016 Highlander lineup. The National Highway Transportation Safety Administration (NHTSA) gives the 2016 Highlander its best rating of 5 stars for overall crashworthiness, while the Insurance Institute for Highway Safety (IIHS) awards the Highlander its best mark of Good in all tests except for the newly instituted small-overlap frontal-offset exam, where it gets the Institute’s second-highest Acceptable score. Owners of the 2015 Highlander again complain about the I4’s tepid gas mileage, and some describe the V6 as a bit sluggish as well. The Highlander’s brakes also lose points with a number of owners, while others find the infotainment system to be occasionally frustrating. On the positive side, owners laud this midsize crossover’s looks and roominess, and folks living in northern climates praise the available AWD system for its performance in snowy driving. What's your take on the 2016 Toyota Highlander? Karen We got the Highlander Hybrid. Love it!! Ours is the LIMITED and only option it doesn't have that I wish it did is the backup sensors. I assumed with all the options on the LIMITED it would include that safety feature. Other than that .... no complaints. Users ranked 2016 Toyota Highlander against other cars which they drove/owned. Each ranking was based on 9 categories. Here is the summary of top rankings. 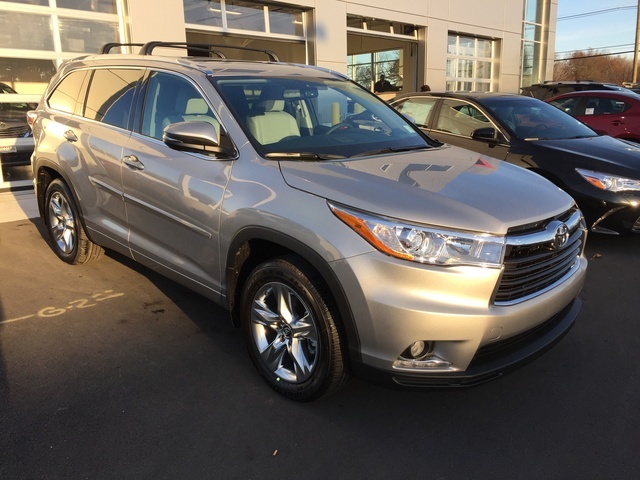 Have you driven a 2016 Toyota Highlander? how do I get the interior light to work when I open the doors? i have a toyota highlander 2016 18" wheels. my father in law had toyota highlander 2016 limited 19" wheels he gave to me the snow tire+ wheehs. its possible i install in my toyota?